Image caption Tristin Bran was a "loving husband and family man"
A motorcyclist who died after a crash with a van was a "hero" to his two young children, his family has said. Tristin Bran, 35, of Fair Oak, Hampshire, died in Southampton General Hospital on Saturday, a day after the crash in the city's Howard Road. 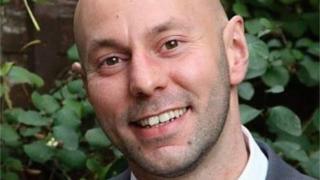 Mr Bran's family said he was a "loving husband and family man", in a statement issued through the police. The van driver, a 49-year-old man, was not hurt. Police said investigations into the crash were ongoing.